Rotterdam 22 March 2019 – Eurorijn International B.V. has leased approximately 18,000 sq.m. warehouse at Ringersweg 9 in Bergen op Zoom. The complex consists of three connected logistics warehouses and is located on business park Noordland in Bergen op Zoom. Following the bankruptcy of the previous tenant, Nijpels Meubelen, the property became available for rent at the beginning of this year. Immediately after the property became available it was fully let to Euro-Rijn, with the exception of the office space. 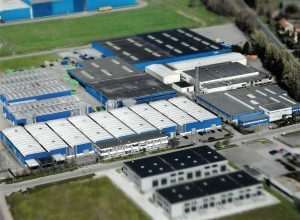 Euro-Rijn has chosen this complex for the expansion of its logistics activities because of its location and direct availability. INDUSTRIAL real estate partners realized this transaction in cooperation with De Lobel & Partners on behalf of Profound Asset Management, which company is responsible for fund and asset management on behalf of the owner.